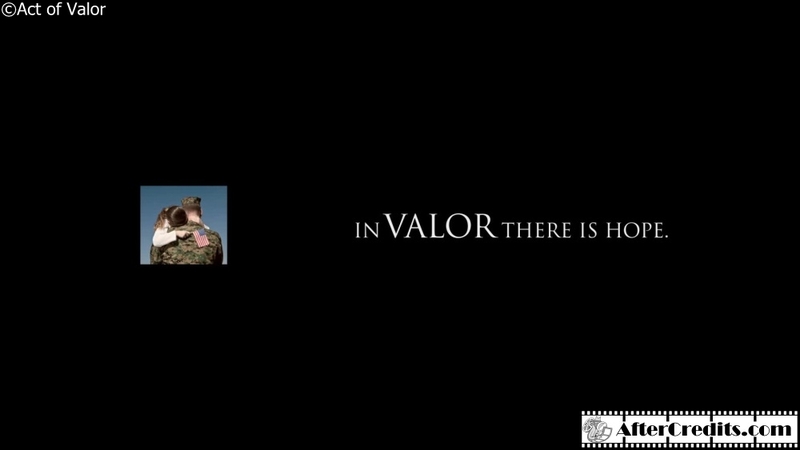 We see the title “Act of Valor which changes to the phrase “In Valor There Is Hope”. 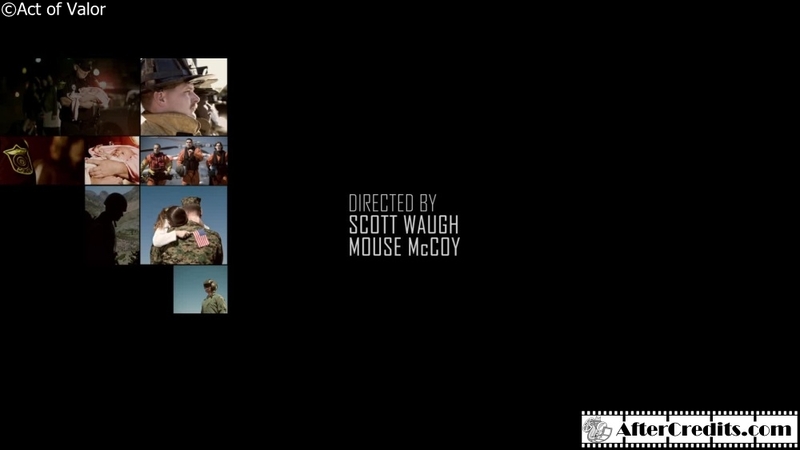 We then see various still images of both military and civilian service members as well as images from American life along side the credits for the first few minutes. 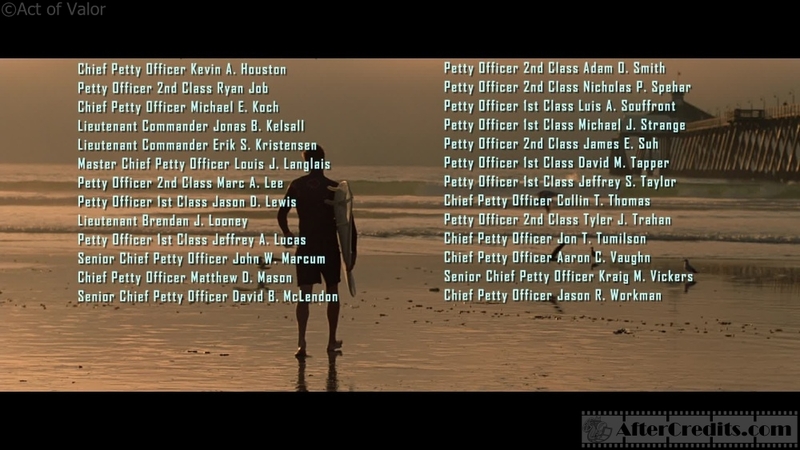 NOTE: This film is dedicated to the following warriors of Naval Special Warfare who have made the ultimate sacrifice since 9/11. 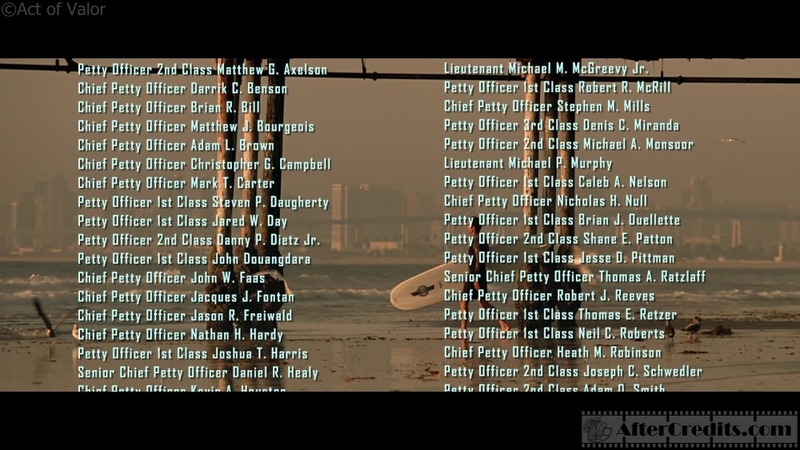 Petty Officer 2nd Class Matthew G. Axelson, Lieutenant Michael M. McGreevy Jr., Chief Petty Officer Darrik C. Benson, Petty Officer 1st Class Robert R. McRill, Chief Petty Officer Brian R. Bill, Chief Petty Officer Stephen M. Mills, Chief Petty Officer Matthew J. Bourgeois, Petty Officer 3rd Class Denis C. Miranda, Chief Petty Officer Adam L. Brown, Petty Officer 2nd Class Michael A. Monsoor, Chief Petty Officer Christopher G. Campbell, Lieutenant Michael P. Murphy, Chief Petty Officer Mark T. Carter, Petty Officer 1st Class Caleb A. Nelson, Petty Officer 1st Class Steven P. Dougherty, Chief Petty Officer Nicholas H. Null, Petty Officer 1st Class Jared W. Day, Petty Officer 1st Class Brian J. Ouellette, Petty Officer 2nd Class Danny P. Dietz Jr., Petty Officer 2nd Class Shane E. Patton, Petty Officer 1st Class John Doungdara, Petty Officer 1st Class Jesse D. Pittman, Chief Petty Officer John W. Faas, Senior Chief Petty Officer Thomas A. Ratzlaff, Chief Petty Officer Jacques J. Fontan, Chief Petty Officer Robert J. Reeves, Chief Petty Officer Jason R. Freiwald, Petty Officer 1st Class Thomas E. Retzer, Chief Petty Officer Nathan H. Hardy, Petty Officer 1st Class Neil C. Roberts, Petty Officer 1st Class Joshua T. Harris, Chief Petty Officer Heath M. Robinson, Senior Chief Petty Officer Daniel R. Healy, Petty Officer 2nd Class Joseph C. Schwedler, Chief Petty Officer Kevin A. Houston, Petty Officer 2nd Class Adam D. Smith, Petty Officer 2nd Class Ryan Job, Petty Officer 2nd Class Nicholas P. Spehar, Chief Petty Officer Michael E. Koch, Petty Officer 1st Class Lois A. Souffront, Lieutenant Commander Jones B. Kelsall, Petty Officer 1st Class Michael J. 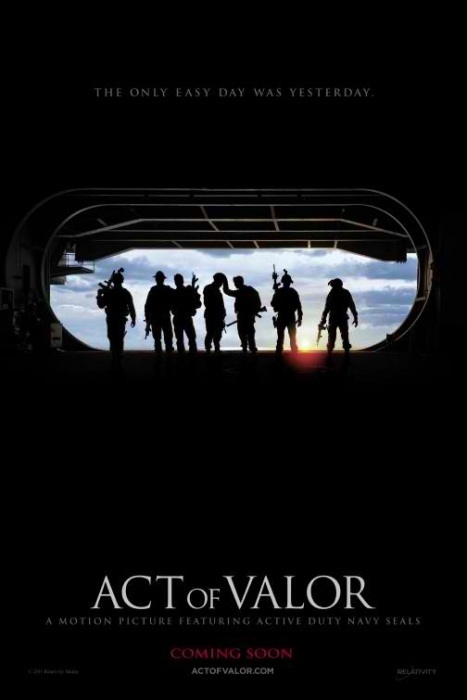 Strange, Lieutenant Commander Erik S. Kristensen, Petty Officer 2nd Class James E. Suh, Master Chief Petty Officer Louis J. Langlais, Petty Officer 1st Class David M. Tapper, Petty Officer 2nd Class Marc A. Lee, Petty Officer 1st Class Jeffrey S. Taylor, Petty Officer 1st Class Jason D. Lewis, Chief Petty Officer Collin T. Thomas, Lieutenant Brendan J. Looney, Petty Officer 2nd Class Tyler J. Trahan, Petty Officer 1st Class Jeffrey A. Lucas, Chief Petty Officer Jon T. Tumilson, Senior Chief Petty Officer John W. Marcum, Chief Petty Officer Aaron C. Vaughn, Chief Petty Officer Matthew D. Mason, Senior Chief Petty Officer Kraig M. Vickers, Senior Chief Petty Officer David B. McLendon and Chief Petty Officer Jason R. Workman. 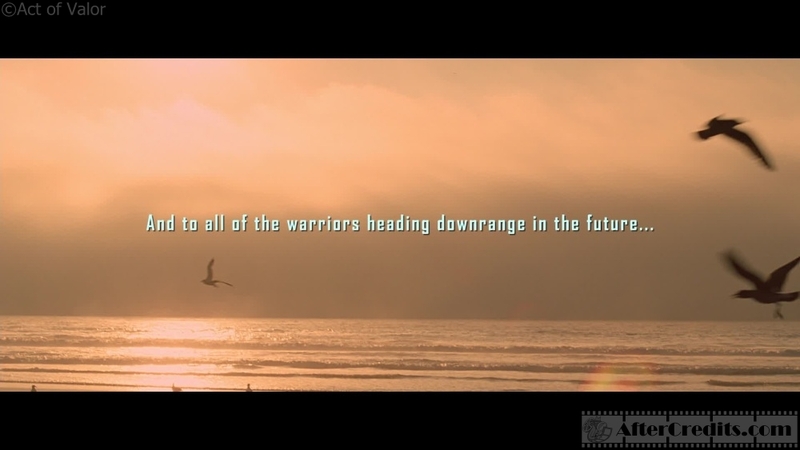 And to all the warriors heading downrange in the future…Damn Few. 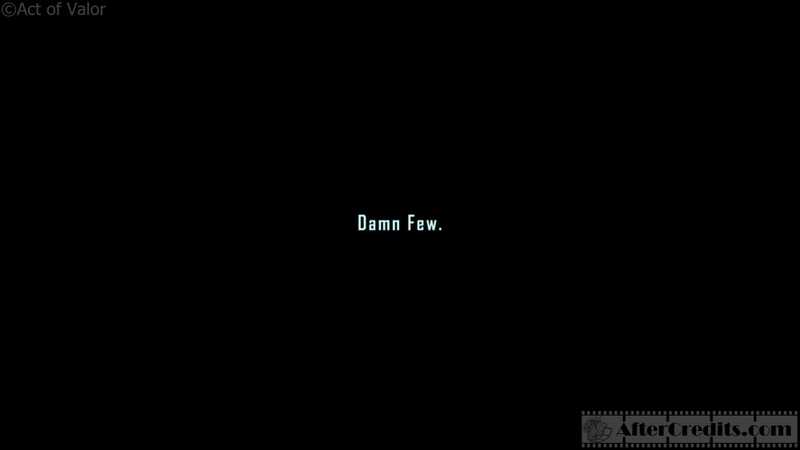 In memory of Al Di Sarro.